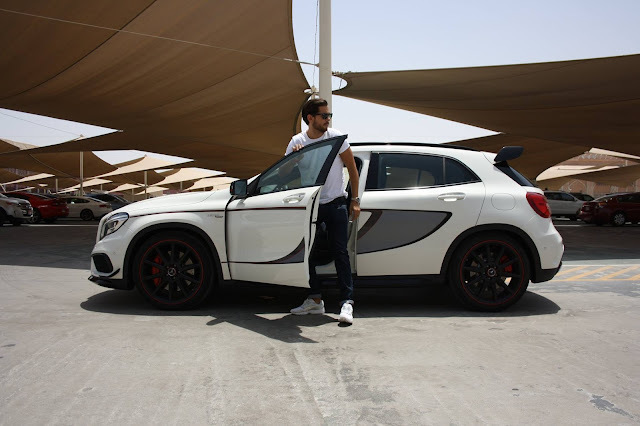 With huge gratitude and thanks to Mojo PR and SIXT Rent-a-car here in Dubai, I was privileged enough to drive around this beauty of a car around UAE's most sought after city. This Mercedes GLA 45 AMG was an absolute joy to drive, with its intense bucket seats, red seat belts, firm steering wheel and an engine that will wake up your neighbours, this car right out of the gates made me feel like I was a professional driver! The GLA shares its front-drive bones with the CLA sedan. The GLA is more all-wheel-drive hot hatch and is a kinder, gentler AMG than what we're accustomed to. 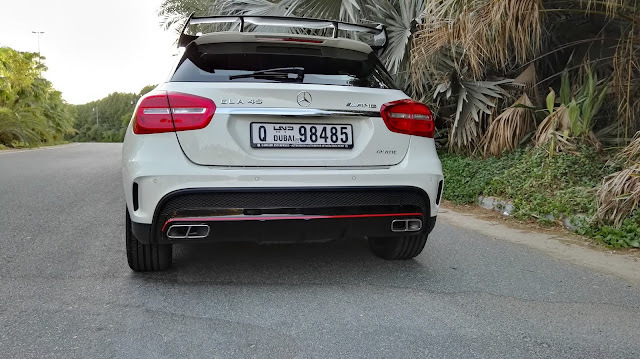 The GLA has the same 2.0 litre turbo four as the CLA45 which is a monster that has 355 horsepower and 332 pound feet of torque, and takes 4.8 seconds from 0-60mph. That's quick!!!! 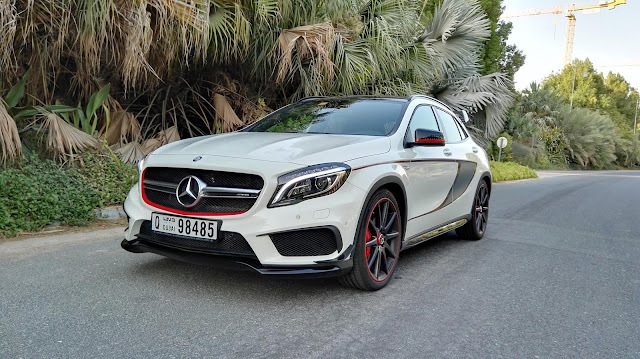 The best review i've read about the this GLA is that it is not a rally car wearing a tie and jacket, it is a deliriously fast pocket rocket Mercedes wearing a leather jacket and chewing tobacco in the back of class, ha....and I completely agree with it. This car was an instant head turner and within 10 minutes of driving it around I instantly saw people taking out their phones and taking pictures as I drove by. The sleek, elegant yet sporty appearance of the car matches the sheer sound and velocity of the engine, and with this colour way of pearl white mixed with carbon, black and fierce red it is a car lovers dream! The GLA's style extends into the inside of the car. From a design perspective, everything inside looks immaculate, especially the toggle switch gear shifter, the suede wrapped steering wheel and the cross shaped air vents. For a test drive of this car or other models check out SIXT rent-a-car!